Your company has just merged. Suddenly, your office is awash in an ocean of land deeds full of legal land descriptions. Your boss comes into the office and tells you that within a week she wants to map the newly merged company’s land positions for strategic reasons. In the past, you would need a $100,000+ investment in software and data just to produce one map. Anyone who has gone down this road knows that a land mapping system implementation can take months if not years. A Better Way to Get Your Land Position on a Map. For a flat fee, map to infinity. Map as few or as many polygons as needed to meet project goals. No investment in land mapping systems required. ArcGIS: Map land parcels directly inside ArcGIS Pro or ArcMap. GIS Data: Upload a spreadsheet file to the web app and download the computed polygons in Shapefile, CSV or GeoJSON formats. FME Transformer: Use the WhiteStarLegalMapper transformer inside a Safe Software FME workspace. REST API: Incorporate our RESTful API into internal or external facing software application. WhiteStar’s high quality databases support land mapping section, township, range, quarter-quarter and lots descriptions. No additional software or data investment required, except for map display. Flat fee pricing. No credit buckets. Detailed lot data available for complete states of MT, ND, WY, CO, UT, KS, OK, AR, LA, MS, AL, and FL. CA and MI in progress. More added all the time. The “WhiteStar Wizard” is available for free from the Apple iOS store. Figure 1 shows is an example iPhone screenshot. This free app also showcases our available data libraries including WhiteStar Culture and WhiteStar Wells. 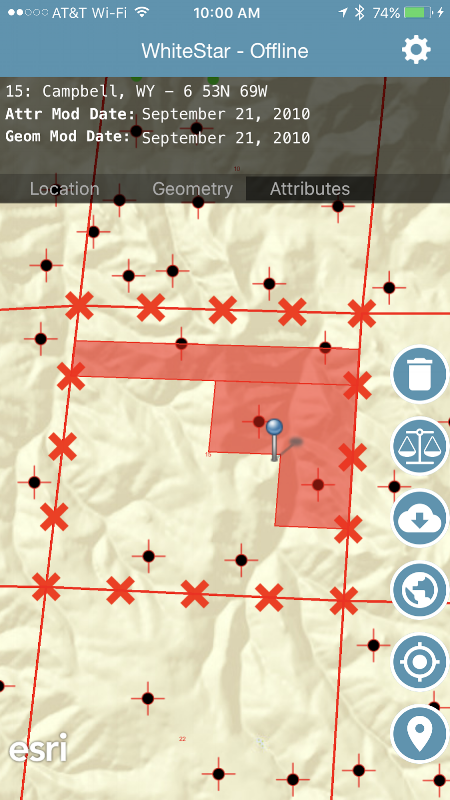 You can press the balance beam icon to key in and map any valid public land survey legal description land polygon. If you want to process tens, hundreds, or thousands of legal land descriptions, WhiteStar Cloud has a way. Batch processing can also be accomplished using the WhiteStarLegalMapper in an FME Workspace. A final method allows a programmer to incorporate the WhiteStar Legal Mapper RESTful Web Service into your corporate intranet. Imagine the power of mapping your leases in the field as the raw data are collected. Make sure your research is correct, complete, and matches the legal documents.